Logistics Plus® is a leading provider of cross-border freight services between the U.S., Canada and Mexico. When your freight shipment needs to travel across the border, you can rely on the North American logistics experts at Logistics Plus to help simplify the process. We’ll help you prepare your cross-border freight documents, clear customs, and resolve any issues before they cause delays. 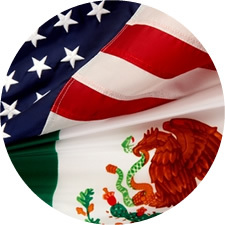 Additionally, our bi-lingual border management staff works with carriers and international agencies to maintain C-TPAT, PIP and CSA security standards. Ready to get started? View our current North American Map, or Contact Us today for more information.